I figure Friday the 13th is as good a day as any to take on everyone who insists on calling the price action in gold earlier this year a "bubble." Many commentators on gold believe that when gold hit $720 on May 11, 2006, gold was close to hitting its previous bubble peak of $850 on January 21, 1980. A new gold bubble had come and gone. For anyone who believes that, this Friday the 13th is not your lucky day. 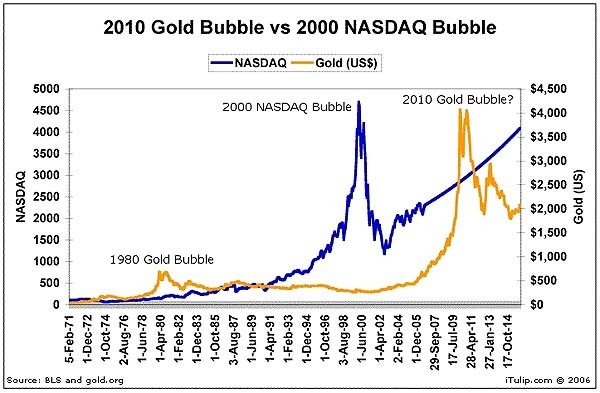 First, let's compare the 1980 gold bubble to the 2000 NASDAQ bubble. Extremes of popular, positive investor sentiment–the general belief that the price can only go up. Core Beliefs that are based on fact, such as the value of the Internet during the Internet bubble, that drive early adopters into the market. Apocryphal Beliefs that are later invented by those who are benefiting the most from the bubble, such as investment banks and venture capital firms during the Internet bubble, but readily accepted by everyone else who is also benefiting–to explain extreme price increases that go far beyond the level justified by the Core Beliefs. A well developed system of sales, marketing and distribution, that includes the mainstream press, and employs an army of analysts, consultants, lawyers, accountants, and so on, all of whom adopt first the Core Beliefs and later buy into the Apocryphal Beliefs. A duration that exceeds the warnings of bubble spotters by months or even years. Gold in 1980 and the NASDAQ in 2000 both fit the criteria for a bubble, and the results as shown in the chart above show a characteristic rapid price rise and decline that occurs during bubbles. Gold currently does not fit the criteria for a bubble. The reason I call my chapter "Gold for People Who Hate Gold" in America's Bubble Economy: Profit When It Pops is that the book is published by a major publisher, Wiley & Sons. Major publishers are interested in large audiences. The vast majority of readers, if they have any opinion about gold, have a negative opinion. They hate it. Thus the title. So, right off the bat, the first criteria for a bubble–popular, positive investor sentiment and the general belief that the price can only go up–is nowhere to be seen. To most people, gold still represents fear, hoarding, economic chaos, political and financial conservativism, and destruction of the environment, all of which they perceive as negatives. I'll call them un-goldbugs and today probably 95% of the population falls into that category. Goldbugs, in contrast, believe that gold represents honest money, protection from government confiscation of wealth via inflation, protection from economic and financial chaos, and political and financial conservativism, which they perceive as, if not all positive, at least good reasons to own gold. To many goldbugs, the government is, on a good day, confiscating wealth by gradually destroying the purchasing power of fiat currency, but may at any moment begin the process in earnest, as happened in the late 1970s, thus the 1980 gold bubble. Or the government may try to confiscate their gold, as happened in the US in 1933. They have also been expecting economic and financial chaos any day now... for the past several decades. In the book, I try to bridge the gap between the un-goldbugs and the gold bugs. I do so from the perspective of one who has traded in and out of gold during its ups and downs for several decades. Whereas goldbugs think now is always the right time to own gold, I make the point that gold is an effective hedge against losses during certain kinds of financial system risks at certain times. One of those times started in 2001. Goldbugs worry that central banks own gold and are therefor in a position to manipulate the price. As I mention in the book, central bank holding of gold is a reason to buy gold, not a reason not to. Central banks protest too much that gold has had no value as a monetary asset since the 1970s. If that's the case, then why do they still own so much of it, over 25% of all the gold ever produced? They have had over 30 years to sell it all off. The reason they hold onto it is simple, and it is the same reason I bought a lot in 2001 and have since then recommended owning some gold since then: to hedge the risk that the current system may at some point enter into a chaotic period. Getting back to the idea that the rise in gold to $720 in May this year was the peak of a bubble and now gold has nowhere to go but down, let's take a closer look at the price of gold, but in real terms, adjusted for inflation. In the chart above, the price of gold is indexed to CPI inflation, using the purchasing power of the US$ starting at $1 in 1971 and declining to US$0.247 in 2006. When inflation is taken into account, the recent price rise is well within the range of price fluctuations for gold since 1983, after the gold bubble completed its regression to the mean. If and–in my opinion–when another bubble in gold happens, it might look something like this. The chart below shows a hypothetical future gold bubble. This is not a prediction that a new gold bubble will happen between 2009 and 2011. No one can say that. But you can "phase shift" this hypothetical future gold bubble years in or out from that date, and increase or decrease its peak and other characteristics of the bubble depending on a number of unknowable factors, and give yourself at least a way of "seeing" what is going on when it does happen. This is important because it is easy to get caught up in the Apocryphal Beliefs that will be expressed by everyone the bubble employs near the top–think investment banks in 1999 and realtors in 2005–so having a picture is useful to keep your head straight. The first thing you will notice is that the so-called May 2006 "gold bubble" appears on the chart as a small blip, like one you might have seen in the NASDAQ in 1996. 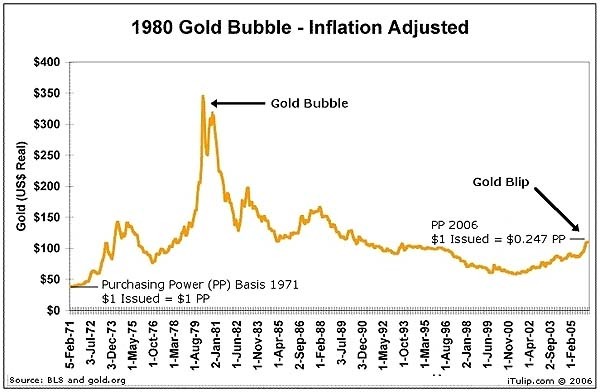 The next thing you will notice is this second gold bubble greatly eclipses the 1980 gold bubble in nominal peak price. But, keep in mind it may only moderately exceed the previous peak in real (inflation adjusted) terms. Two other reasons why the recent $720 peak does not represent a bubble. One, that gold has to reach US$1,646 to even equal its previous 1980 bubble peak today. That means a 280% increase from today's price–right now. Forget $720. That's less than 50% of the previous "real" peak. Two, an asset bubble tends to peak well above the nominal price reached when it peaked before. For example, the DOW bubbled up in the early 1960s and in 1965 peaked at 944. 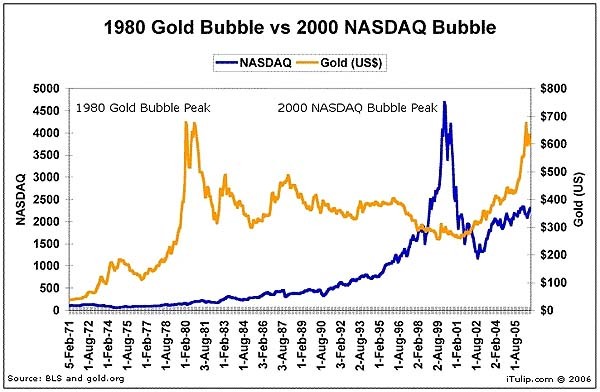 It bubbled up again from 1998 to 2000, peaking at 11,497, and is making classic "echo-bubble" highs today–note the secondary peaks in the 1980 gold and 2000 NASDAQ bubble chart. Adjusted for future inflation, should inflation continue at its current rate and our hypothetical future gold bubble occurs starting in 2009, a nominal peak price around $2,500 is a fair target for a new bubble, which is a price I talk about in the book. But it's just an estimate. No one knows. The notion that gold has experienced a "bubble" recently is absurd. Do expect, as usual, a lot of volatility in the gold price. And to the central bankers who say there is no reason to own gold and that I should–as an individual investor–sell it, I say, "After you." Founder & President - iTulip, Inc.